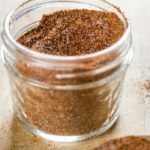 Homemade chili seasoning made with six ingredients. Combine all ingredients and store in airtight container or jar. Two tablespoons of this chili seasoning will replace one chili seasoning packet.